Yesterday I received a review copy of Jerusalem • Biblical Archaeology from Carta. 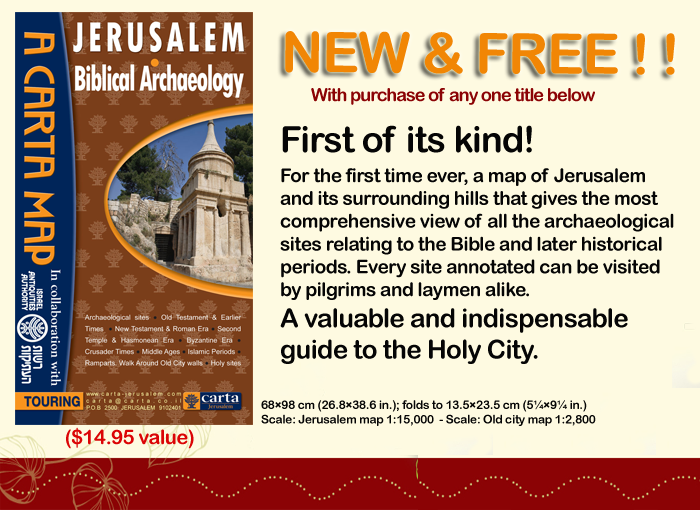 This is a wonderful resource for anyone traveling to Jerusalem, or anyone interested in the archaeology of the Holy City. The map of the Biblical Archaeological Sites of Jerusalem are printed on one side of this 2 ft. by 3 ft. map. Half of the other side is an enlargement of the archaeological sites in the Old City. The other half contains helpful information about sites on both sides of the map. This map was prepared by Carta Jerusalem with the assistance of Yuval Baruch PhD, in collaboration with The Israel Antiquities Authority. This is exactly the type map I like to use when rambling through Jerusalem. And here is a special offer from Carta. Leen Ritmeyer, The Quest (list price $60.00; sale price $48.00). Dan Bahat, The Carta Jerusalem Atlas (list price $60.00; sale price $48.00). Josephus, The Jewish War (list price $60.00; sale price $48.00). See Todd Bolen’s review of the book here. These are all great books. And you get the map free when you buy one of them. Use the Search box for Jerusalem Archaeological Sites to locate the map. You can check the Carta Jerusalem website here for details of this special offer. This entry was posted in Archaeology, Bible Lands, Bible Places, Bible Study, Book Review, Books, Israel, Travel and tagged Bible maps. Bookmark the permalink.